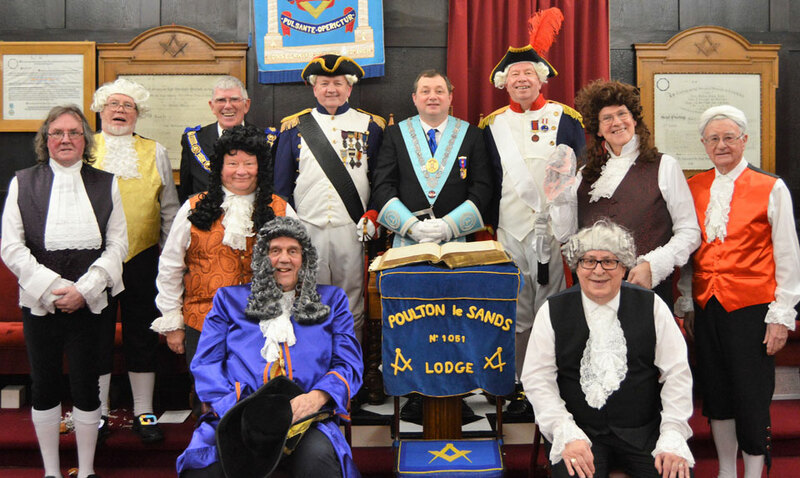 Poulton Le Sands Lodge No 1051, which meets at Morecambe Masonic Hall was host to the demonstration team from the St Helens and Prescot Group, who were presenting a ‘Timeline Drama and Pageant’ at their regular meeting. The lodge was honoured for the evening with the presence of one of its own members, the Provincial Grand Master Tony Harrison, as well as grand officers Phil Gardner, Keith Kemp and Peter Mason as well as Lancaster and District Group Secretary Chris Larder plus a host of visiting brethren. Due to difficulties in matching available diary dates, this was the first occasion that both Tony and the ‘Timeline performers’ had managed to meet up and the PrGM had previously expressed how much he was looking forward to seeing their production. The WM Nigel Norris started the evening’s proceedings off by warmly welcoming all the guest and visitors to the lodge. Following a brief open and close meeting, the players took over the lodge room, setting the scene for the pageant. Members of the Timeline team dressed in period costume, whilst enacting their drama. The ‘Timeline Pageant’ was presented from a script written by Frank Davies, to follow a timeline dated 1646-1813, which he had scripted to highlight a small number of historical events and characters which left their mark on the development of the Craft. Frank first had the idea back in 2014, but it took up until December 2016, after many rehearsals and script adjustments, that a full-dress rehearsal took place at the Lodge of Loyalty No 86. Since that date, 26 performances have been undertaken, some of which have been to non-Masonic gatherings, 21 out of 22 groups visited in the Province, 1,000 miles travelled and 1,500 people entertained (including 200 ladies). In the process the team have raised £4,250 for the St Helens and Prescot Group MCF 2021 Festival fund. The cast pay all their own expenses and their total financial outlay per individual performer is approaching £500. A further example of their commitment is that one of the team has recently moved to Lanzarote, but he is willing to commute to continue to perform with the pageant team! The cast comprised of Frank Davies, David Burgess, Norman Lay, Allen Yates, John Dawson, Peter Hornby, John Roughley and Chris Maloney. Each cast member was dressed in period costume and told their story, revealing to the audience facts about themselves and their lives and through a well scripted conversation, the story unravelled on the birth of United Grand Lodge of England. The drama was also spiced with humour to keep everyone entertained, with a little bit of fun targeted at the PrGM and his colleagues of Grand Lodge. The evening concluded with fun and laughter at the festive board, including a raffle, which raised £280 and the master’s gallon of whisky draw, which raised a further £300 (with tickets sold over three months), making a total of £580. The sum total was split with the pageant team, making the donation to them £290. The brethren of the pageant team put on a first class and most entertaining production and it is recommended to all brethren to try and get to see it. Tony Harrison (second left, rear row), with the WM Nigel Norris (centre), surrounded by the cast of the ‘Timeline and Drama Pageant’ team.